... I'd spent a fair bit of time in and around Parramatta, near Sydney in New South Wales, before going on to Tasmania. Talking to Parramatta children from four schools (two primary, two secondary) I asked them all if they could bring just ONE item of furniture from home what would it be. Cue a long chat about how they find it hard to read sitting upright in an office / school chair (does ANYONE on the planet ever do this at home?) and how they prefer "relaxed" seating, or sitting on the floor. One said he'd bring his bed in!! It is also pretty hard to be collaborative or sociable on the standard school chair isn't it? It isn't built for conversation to the left or the right. And the secondary children also spoke of how they missed the playfulness of their primary school lives. Well, goodness knows I've said all this often enough and in this picture here we are again at the blessed St Aloysius in Tasmania where they have playful and comfy and social all in one go with these sofas which they found, affordably, in a library catalogue. You could read, learn, collaborate in this school, couldn't you? Thank you so much for writing such a glowing review of my library! I chose the furniture with comfort and ease in mind. Students are going to want to be social, be comfortable, be relaxed (including putting feet on furniture), so I thought I may as well get furniture that they can do so to. I am a high school student from P.K. Yonge D.R.S. 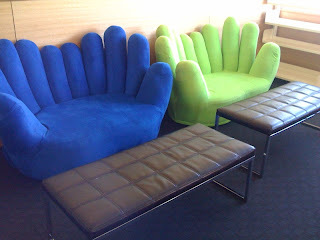 I had the question about the delightfully awesome chairs in the photo. I appreciate you coming to our school to present, my dad, and I, really enjoyed the presentation. I also wanted to add that I also really liked the cubby idea. I forget where it is from... but I want to say Thailand... But basically the kids were reading inside little hexagonal boxes in a wall. I must say, I would absolutely love being able to read in a place like that. The second learning centre, to be ready for February 2010, is well under way. I'll post more images when it is complete. There are a couple of significant changes, but basically it is the same. One of my students remarked about chatting to you from Hobart via Skype a week or two ago. He was impressed with what you had to say! Oops! Forgot to click on the 'email follow up' button! Am doing so on this post!